As ex-pats, our lives are often defined by what country we are living in and for how long. And while our houses may be temporary, our home travels with us. Having said that, there's always a touch of sadness in saying farewell to yet another house. Last June, as I stood in our living room, after making the final check to make sure we hadn't forgotten anything, I took one final glance out the wall of windows at the lights of Kuwait City sparkling below me. Our apartment's view over the Gulf and downtown Kuwait City had always been one of my favorite things about this house. But as I stood there, I had flashes of the previous year we lived here. In that time our lives had changed forever. Primarily, we became parents with the adoption of our daughter. Plus we had made some great friends, had taken a lot of fabulous trips, and had done our best to live life to the fullest. But as I watched the cars race up and down Gulf Road, and the lights of the city's skyscrapers reflect off the waves, I found it was the more mundane memories that were coming to me. This simple rug beneath my feet that came with the furnished apartment was where my daughter had taken her first steps only a few months earlier. The desk in the corner was where I wrote my articles for my first paying gig. This house was where my daughter's first Christmas was, as well as her first birthday. It was also the last home for our sweet cat Ricky, who we'd lost only a week earlier. I had made iced camel cookies and about 200 peanut butter balls in the kitchen for our Christmas cookie party last year. I had walked literally hundreds of miles along the Gulf with my girlfriends as we pushed our strollers in the pre-scorching summer months. I had gone on one of my crazy crafty trips and made 15 cloth diapers out of my husband's T-shirts at that dining table. I created an intricate paper butterfly mobile for my daughter's room that I only realized later I couldn't hang because the ceilings were too high, so it hung off of a pipe in our guest bathroom instead. And in the tiny little bathroom attached to the maids quarters, I did my best to help a little blind kitten I found along the Gulf. It took me three days of trying to grab him and then I spent another day cleaning him up and trying to get him to eat while he purred in my lap. In the end I took him to the vet but he was too far gone, and we lost him. I try to tell myself that at least he had a warm soft place in the end and got his purr back, but it still hurts. We had some silly times too, of course. Like when I was taking a shower and the glass door decided to fall off a hinge so I'm standing there naked, holding the 200 pound door, under the shower, screaming for my husband at the other end of the apartment. We got it balanced so I was able to get out of the shower and we called for maintenance to come remove it in case it fell (or exploded into tiny shards of glass, like happened to another friend). It only took about three days and a little nudging, but they did finally come and replace it. Then we had the telephone guy who would only come to repair the phone at 10 o'clock at night. That took at least a week to iron out. And one of my favorite moments, was watching the washer repairman use his iPhone as a flashlight when he was checking out the drum. Quite a juxtaposition from the repairmen in Egypt who would routinely jam a screwdriver into a socket to see if it was live. Like any house, this one was filled to the brim with memories, good and bad, but all of them densely rich. So as I closed the door and headed downstairs to where my husband and daughter were waiting in the car that would take us to the airport, I said a little thank you to this house that had been a home to us for the previous year. Then I packed up my memories, wedged them into a corner of the diaper bag and headed out; wondering what our next house would hold and thinking about all the amazing memories that were to come. More Museum Mannequins, a Touch of Quirk, and ... Elmo? So, the last remaining item on my Kuwait Bucket List (that wasn’t closed for renovation or involved taking a boat) was to visit the Kuwait Heritage Museum. Technically it would be the third time I’d been there, but I managed to time it right and finally arrived before the four-hour daily lunch break. I also managed to convince two friends to come along and bring their toddlers. Based on previous museum outings, I had forewarned them that it might be a bit “quirky,” which I think only intrigued them more. The museum is located behind the Sadu House on Gulf Road (north of the Grand Mosque). The entrance looks a little unassuming, but once you walk through their “welcome center” (which was empty sans a sleepy guard and some dusty security equipment), you are in a compound of sorts, with interconnected buildings and a grassy quad that’s actually partially roofed, which offered lovely shade on a day where temps hit 118 degrees. We asked Snoozy the guard where we should head to first and he indicated the building on the left; so we headed out. This building housed an extensive exhibit on the history of Kuwait’s coins and bills as well as their stamps. 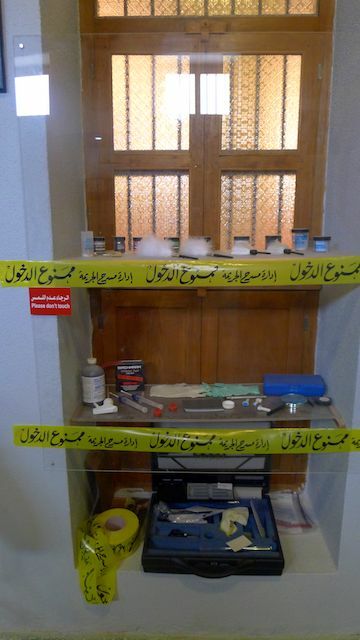 Things were well-displayed in glass cases, and had some labels in English, but most were in Arabic. For an avid philatelist or numismatist, I'm sure it would have been rip-roaring fun, but for me I mostly appreciated the air conditioning and good lighting. When we first walked in, the woman at the desk told us not to miss the archeological exhibit in the room off to the rear far right, but also made sure we knew that there was nothing to see on the second or third floors -- sounding suspiciously like, “Pay no attention to the man behind the curtain!” Yeah, heard that before! But we did wander in to the archeological exhibit which had an impressive display of ceramics and coins that have been unearthed on Failaka Island, just 12 miles off the coast in the Arabian Gulf. They had even uncovered some Alexander the Great coins, along with the standard potsherds and questionable shiny bits. The next building we came to was labeled the “Heritage Museum.” Inside there was a rather imposing Conan-like guard. As we smiled and walked past him to head back into the exhibit, he stopped us and in broken English said something about a film. It took twenty months, but I finally found someone to practice my Arabic with... too late. We were at a standstill; even with my go-to mime talents we were clueless as to what he was trying to tell us. But regardless of the content, it was quite apparent that he did not want us to enter the exhibit. Finally he dashed off and after waiting around for a minute and staring at each other, we decided to just explore the exhibit anyway. Within a few minutes Conan returned with a woman at his side who spoke English. She explained that the film, or show, at the planetarium was starting now so if we were interested we could go do that first. How sweet, Conan just wanted to make sure our museum-going experience was complete. We did a quick confab and decided that taking three squirming toddlers into a planetarium show might not have the best outcome, so we thanked them for the information, but decided to forego the planets and continue on through the exhibit. The Heritage Museum is set up like Kuwait City must have looked pre-riches. We followed the windy "street" past the old-fashioned cobblers shop and the spice shop and the dishdasha shop, peered into mock-ups of dining rooms and living rooms and even a bridal suite. There were hundreds of mannequins used (maybe those who couldn't work here, ended up at the Othman Museum on balconies and flying carpets) and yes, I still found them creepy. Since we had the museum to ourselves, we let the toddlers toddle and just meandered behind them. I'm all for using any safe (relatively contained) opportunity to get the wiggles out, be it an Ikea display room or a mock-up of Kuwait City. Wiggle on! As we concluded our tour of olde time Kuwait, we wandered back outside into the quad area and let the kids explore the paths and the grassy bits. My daughter has spent over a year of her 15-months of life in Kuwait, and in all that time it never occurred to me that I had been neglectful in exposing her to grass. But that was quite apparent when I went to put her in it and she just sat there, frozen in horror. Hmmm, okay, "Expose child to more nature" is now on my new bucket list. From here we wandered over to the remaining building that we had yet to explore. As if on cue, Conan returned to our side and proceeded to lead us to his favorite, the planetarium. When we were inside, he then, without any warning, scooped up my friend's son and carried him up the ramp leaving us no choice but to follow him. Note, trying to scoop up my own toddler with one hand and push a stroller up a curved ramp with the other was a feat I was ill-prepared for. But I made it to the top where Conan proceeded to open the door and walk in to the darkened theater where we heard the unmistakable sounds of... Elmo? Yup, that's definitely Elmo in a Kuwaiti planetarium. So, feeling more curious than pressured I pushed the stroller in with one hand and carrying my daughter found myself in a very very dark theater staring up at an immensely large Elmo and Big Bird on the planetarium ceiling. I parked the stroller to the side, having no idea if it was on someone's toes or not, and felt around with my hand trying to find a seat. I finally found one and we sat; for about three minutes. Even with the lure of a Godzilla-sized Elmo, my wiggly daughter was unimpressed. So, feeling around again, hoping not to grab anyone's hijab or toupee, I managed to find my stroller and backed out of the theater. As we waited for our friends, we explored the few exhibits in the planetarium's lobby area and wandered outside to try not picking up all the trash bits we saw -- such a hit with toddlers. After the show finished, we were curious if the Elmo film was a daily thing. So we sought out Conan or one of his friends. We found Conan, but even with my minimal Arabic, he couldn't understand, "Is the Elmo/Sesame Street film every day?" (I think "Elmo" was throwing him off.) But we again located the woman who helped last time and she was able to dig up a planetarium program; from last year. Here was where she shared a little secret with us, "Just come and ask for the Sesame Street film, they can play it anytime." Good to know. There were several other buildings on the compound, but it wasn't clear that they were meant for public exploration, so we took a little snack break next to a large dhow boat, then headed out. All in all, it wasn't quite as quirky as I was expecting, but at the same time, it had just enough "quirk" to make it well worth the visit. I made the vow over a year ago that by the time I left Kuwait, I’d have found ten things to love about it. It’s been almost 20 months, and I’m delighted to say that I’ve done it! Now, I’m not promising that these are reasons to divert your flight to Bali for a ten-day-layover in Kuwait, but if you happen to be here, or are presented with the opportunity to live here, these might help pass the time. 1. No list of favorite things in Kuwait could be complete without saying “the mall.” Love it or hate it, you’ll find moments where you’re grateful for Ikea or Pottery Barn Kids or even The Cheesecake Factory. Not to mention just a comfortable clean place to avoid the scorching summer heat. 2. Parks & walking paths. Now, Kuwait’s parks can’t rival Yosemite or anything, but for what they are, and having no other options, I found myself very grateful for them. For eight to nine months of the year, the weather in Kuwait is basically perfect, making daily walks a lovely option. 3. Subsidized gas. Yeah, no surprise really, but the cheapest thing you can buy in Kuwait is gas. Too bad you can’t stock up. 4. Gulf walking. From approximately September through early May, one of my favorite things to do was walk along the Gulf. Bean and I would meet our friends and for two or three hours, we’d walk and gab and enjoy the waves and sea breezes while we clocked 6-8 miles. Granted, it wasn’t all peachy, we frequently had to dodge speeding motorcycles on the sidewalk who were too dumb to drive on the road, it was heartbreaking to see so much trash strewn on the beaches and in the water, there were men who would periodically hassle us, and in the end I had a friend who got mugged for her smart phone while walking with her baby. But if you remove all the people and the trash, it was truly lovely. 5. Drinking fountains. I love them; I love finding the unique ones hidden back in the neighborhoods. Granted, I’d never actually use one, but that doesn’t stop me from admiring them. 6. Flowers and landscaping. As a predominantly barren desert country, Kuwait has done a remarkable job spreading the greenery. They have a rather extensive desalination project, which allows for year-round trees and bushes and even flowers lining the highways. There’s a constant crew of gardeners trimming and raking and watering everywhere you turn. For someone coming from another desert country (i.e., Egypt) I found it remarkably green here. Granted, if you’re arriving from Ecuador, it’ll feel like you’ve been dropped into the middle of the Arabian desert; and you have been. 7. Gardening. For the first time in our adult lives, my husband and I attempted a vegetable garden. Granted, maybe Kuwait wasn’t the best spot to cultivate our green thumbs, but it wasn’t for want of effort, desire or even supplies. Might be a bit surprising, considering the lack of dirt, but there are tons of vegetable seeds and plants available here. When we went to purchase our seeds, we ended up going a little crazy and bought everything from watermelon to lettuce to broccoli to green beans to zucchini. We also tried growing garlic from cloves (completely unsuccessful) and bought an entire palette of tomato plants for less than $4. In the end, we managed to grow and consume about four cups of broccoli, five sad little zucchini, maybe 20 tomatoes and some strange white radishes, which was odd because they were practically the only seed we didn’t purchase. 8. Proximity to Oman. In a mere 90-minutes, you can be in wonderful glorious Oman. You can head for the mountains, explore the city, camp in the desert, or dive with the turtles. It’s all there and if we keep this hidden gem of the Middle East to ourselves, then it’ll remain as pristine as it is today. 9. Good little museums. Through all my wanderings, I will say that Kuwait has some really nice museums. None of them are so grand that you couldn’t explore them in a few hours, and yet they have some truly amazing exhibits. It’s a great way to spend a morning (but keep in mind that most shut between noon and 4pm, for whatever reason). 10. My last, but most important, reason for loving Kuwait is that it was my daughter’s first home and where I became a mother. So, for that reason alone, I will always appreciate what Kuwait gave me: lots of family time without the worries that I’m missing something fabulous out there. If you check out “Lonely Planet: Oman, UAE & Arabian Peninsula,” you may be surprised to learn that the number 1 “spectacular Peninsula” landscape listed for all seven countries (Qatar, Bahrain, Oman, Kuwait, Saudi Arabia, UAE, and Yemen) is Mutla Ridge in Kuwait! Of course, then you read on and you learn, “While not a particularly spectacular line of hills [umm… mild contradiction to their earlier claim], Mutla Ridge is about as good as it gets in Kuwait… [and] Although the land mines have been cleared, you should stick to the paths in case of explosive remnants.” Wow, sign me up! Surprisingly, in spite of these claims, and further warnings from other friends regarding snakes and scorpions, I managed to convince my husband and our friends, Molly and Arthur, to make an excursion out into the wilds of Kuwait. I tried to downplay the whole landmine-snake-scorpion aspect and instead suggested we bring picnic stuff for car picnics (it will be 112 degrees out, as well) and with any luck it’ll be one of those wonderful clear Kuwait days where we’ll be able to perch at the top of Mutla Ridge (which incidentally is the highest point in Kuwait) and gaze down at the modernity of Kuwait City. Then, if we’re feeling particularly jaunty, we can continue north another hour to the border of Iraq before turning around and heading home. All in all, a fun little morning outing with hopeful camel spottings along the way. So, at 9:00am, we packed up our two cars, our two toddlers, our snacks and drinks and cameras and headed off caravan-style! Twenty minutes into the drive, as we were passing the 360 Mall, the problem became quite apparent; visibility was dropping steadily. “This looks bad,” my husband said. “We’re heading directly into a sandstorm.” “Naw, we’ll be fine. A sandstorm is constantly moving, it’ll just pass right over us,” I said optimistically. “Um, yeah, they move, but they also cover entire countries as they do it.” Such a poop-head. Molly called to see what we were thinking. I explained my optimism versus my husband’s pessimism, but even as we were speaking visibility was getting worse; much, much worse. “I think we should turn around,” my husband said. “Fine.” (insert sulk) “We could head back to 360 Mall and get breakfast,” he added. I suggested this to Molly who agreed it sounded like a saner plan. So, in the blinding sandstorm we turned around, and with Arthur taking the lead since he had his GPS up and running, he lead us safely to 360 Mall. Well, we made our attempt, which counts for my bucket list. Since Molly and Arthur are here for another year, I suggested they try it again in the Fall and send us pictures. So, in the end, I guess what they say is true; no matter how hard you try, all roads in Kuwait do lead to the mall. This large historic house, built in the late 1940s, was turned into a museum of the heritage and history of Kuwait. Currently, it includes the Kuwaiti House Museum, the Maritime Museum, the Heritage Hall, the Drama Museum, the Journey of Life Museum, and Museum of Historical Machinery. As I paid the 1kd, the woman slipped by me and went in, so I said with a bit of a snide tone, “What about her? Only I have to pay?” I know, obnoxious. But after five years in the Middle East, and always being charged more for being a Westerner, I just had to say something. It didn’t matter, they ignored me and I paid. Since it was early on a Thursday morning, there were very few people in the museum, so as Bean and I explored we inevitably kept bumping into the Arab woman. By the third time, we both laughed and smiled, and found ourselves chatting about Bean. The first one we entered was about 4’x 8’ and was the POW Museum; dedicated to all the prisoners of war and included a fairly morose skeleton display. Then there was the Emir Museum, with paintings lining the walls of all Kuwait’s Emirs, and the Currency Museum, which showed Kuwait’s currency history. This was where it finally sunk in for me just how young a country Kuwait is. Up until 1961, they were using Indian rupees for currency. But when they gained their independence from the British, they finally minted their own bills and coins (Kuwaiti dinars and fills), and the displays showed the various printings over the last 50+ years. Each side room was small, but had nice displays and even some descriptions in English (though most were in Arabic). 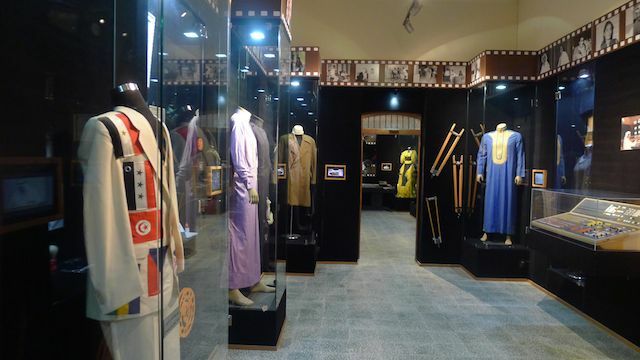 We wandered through the drama displays, showing famous television and movie stars and displaying their costumes or props from (apparently) famous scenes. In the US, it would be like seeing Lucille Ball’s chocolate factory outfit on display, or Mr. Rogers' sweater. At the back of the main room there was a hallway that led to a mock-up of an old Kuwaiti house – long before the days of the ludicrously large villas. There was also a street scene of sorts, with little shops lining the edges, selling books or food or Coca-Cola. We saw the history of the Kuwait Oil Company as well as some rather horrifying photos of the oil rigs burning when Saddam retreated. 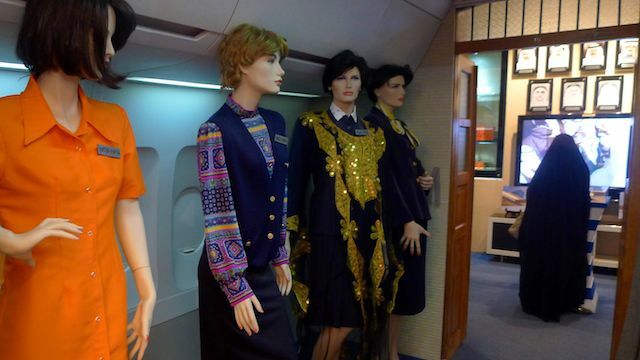 There was an amusing display of Kuwait Airlines, showing the history of the flight attendants’ outfits throughout the years. Short skirts in the 50s and 60s, but come the 80s and long filmy jackets (almost robe-like) covered the ornately gilded uniforms. Frankly I think they’d be a pain to wear on a plane and serve fruit juice in, but what do I know. In the room for the Kuwait Department of the Interior (and you feared there wouldn’t be one! ), there was even a display of the history of the car registration forms over the years – riveting stuff, I tell ya – as well as a display right out of CSI Kuwait’s crime scene kit. Despite any unintended campy-ness, it was a well put together museum. Everything was displayed nicely and most things were labeled. The one thing, and you knew there would be, was the mannequins. They were everywhere! The ones displaying uniforms or fight attendant outfits or sitting in a tank were fine. It was the random ones placed throughout the museum that I found a bit disturbing. Several times, I had to look twice to see if one was a real security guard, or a mannequin posing authentically. As we entered the area with the little shops, I glanced up and saw a man and woman on the second floor peering down on us. It was only seconds later that I realized they were mannequins. Why would there be mannequins up there? But the weirdest of all were the man, dressed like the ground crew at an airport, and a woman seemingly perched on a flying carpet above us. She was holding one end of a rope with the other dangling down just out of our reach. I have no idea of the significance, but it was strange; just very strange. But marginally-creepy mannequins aside, I could recommend swinging by and spending an hour winding in and out of the little rooms. It’s very stroller-friendly, which was nice, and was air conditioned, which is important in the Kuwait summers. So, for those interested, the museum is located in Hawally on Abdullah Al-Othman Street and they are open 9:30a-12:30p and 4:30p-9:00p, every day except Fridays. Pictures are allowed and there’s allegedly a café inside (though I think I was too distracted by the mannequins to find it), and if you come dressed in authentic Kuwait garb, you may be able to get in for free.